You’re busy trying to lead a “full” life. But does it really feel full—or are you stretched too thin? Enter Stew Friedman, Wharton professor, adviser to leaders across the globe, and passionate advocate of replacing the misguided metaphor of “work/life balance” with something more realistic, sustainable, and enriching. According to Friedman, the idea that “work” competes with “life” ignores the more nuanced reality of our humanity—the intersection and interaction of four central domains: work, home, community, and the private self. The goal is to integrate these areas harmoniously instead of thinking only in terms of trade-offs. It can be done. Each of these admirable, though surely imperfect, people exemplifies a specific set of skills—for being real, being whole, and being innovative—they learned through trial-and-error that reduce conflict and produce a sense of purpose, coherence, and optimism in their lives. 18 questions that could change your life. Take the Skills Assessment and learn how good you are at being real, being whole, and being innovative. Discover which of these six great leaders has strengths most like yours. Based on in-depth interviews and original research, their stories paint a vivid picture of the ways these very different leaders use specific skills to act with authenticity, integrity, and creativity—and they prove that significant professional or public success is accomplished not at the expense of the rest of life, but as the result of meaningful attachments to all its parts. 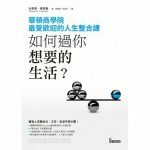 With dozens of engaging easy-to-do exercises for practicing these skills, curated from research in organizational psychology and related fields, this book will inspire you, inform you, and instruct you on how to take realistic steps now toward leading the life you truly want; to find both greater freedom and more harmony among the different parts of your life by using your unique gifts to be of service to others. [Friedman] explores the idea that truly winning people over starts with knowing what you care about, and then being able to express that in ways other people can relate to. 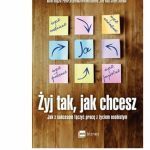 Friedman’s book is a good starting point for dealing with the dilemmas of the modern workplace and beyond…Leading the Life You Want gives you tools to help you craft your own approach. In Leading the Life You Want, Friedman masterfully weaves together six life narratives to show exactly how any of us can live a more richly integrated, meaningful and satisfying life with others. 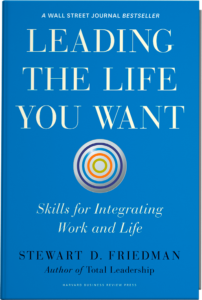 In this fascinating and timely book, Professor Friedman draws on insights from the inspiring stories of six people to provide a deep analysis of the skills needed to lead the life you want and what it takes to develop these skills. This is a must-read for anyone seeking to create that elusive goal of modern lives—the purposeful integration of work and life. 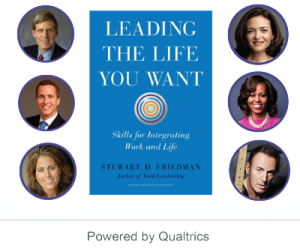 By linking the personal and professional success of six very different and highly successful individuals, Stew Friedman has given us new insight into the mechanics of living a productive and satisfying life of service. Well done! This is a great manifesto for getting it done. Bravo! I love this book! 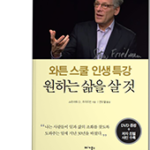 Friedman’s inspiring and refreshing Leading the Life You Want, through its personal and interesting stories, is a compelling case for why business leaders should embrace all aspects of life and how they can do so. This is exactly what talent in today’s market is looking for. Laura E. Kohler, Senior Vice President, Human Resources, Kohler Co.
Great stuff! Teddy Roosevelt famously said, ‘The best prize that life offers is the chance to work hard at work worth doing.’ In this engaging, instructive, and insatiably useful book, Stew Friedman shows all of us how to win big at work that matters, without losing ourselves in the process. Stew Friedman shows how to harness your passions to pursue four-way wins—in your work, home, community, and most importantly, for yourself. Absolutely wonderful. Read it, and you will be inspired to live and work like never before. Leading the Life You Want delivers a much-needed surge of inspiration. Stew understands that pitting our passions and responsibilities against each other is a losing battle. Instead, he teaches a masterful strategy to integrate self, career, family, and community—an approach that has allowed me to grow as a CEO, mother, and community activist. Huffington Post – Ready To Live a Richer Life With Others? Financial Times — Leading The Life You Want. Globe and Mail — Is Your Life Out of Control? Try These Exercises. Fast Company — How To Be A More Authentic and Confident Leader. Philly.com — Forget Work-Life Balance to Lead the Life You Want. Legends of Springsteen — Leading the Life You Want by Stew Friedman. Inc. — Why Great Leaders Are Made, Not Born. Investors Business Daily — Many Want Work-Life Balance But Should Aim For Blend. Forbes — Are You ‘Leading The Life You Want’? CEO.com — Leading The Life You Want. HR Magazine — Men Need Work/Life Balance, Too. Yahoo! Small Business Advisor — Why You Shouldn’t Try To Balance Work and Life. Entrepreneur — How to Be Productive and Still Have a Fun Weekend. Forbes — Work-Life Integration: The New Way to Balance Your Career and Home Life. Working Mother — How to Lead the Life You Want. Forbes — Why Work/Life Balance is Folly. Business Insider — Wharton Professor Describes ‘The Worst Thing You Can Do’ In Your Career. The Business Journals — Forget Work-Life Balance: Take A Cue From Sheryl Sandberg and Bruce Springsteen. Inc. — 4 Surprising Secrets To Work Life Balance. Business Insider — A Wharton Professor Explains Secret to Living the Life You Want. Forbes — Leading The Life You Want. Wall Street Journal Business Best Seller. Forbes 8 Noteworthy Books of 2014. Time 10 Tips and Quotes from the Best Leadership Books of the Year. CEO Read Business Books Best Seller List for 2014. Forbes Top 10 Creative Leadership Books of 2014. 800CEORead — Jack Covert Selects. Forbes — 13 Recommended Readings For Creative Leaders This Fall.